Take your pick from these fantastic events happening over the coming days. May Contain Food, May Contain You encourages audiences to think about the sensory, cultural and social implications of food. Sat around themed circular tables, the audience will be served a playful performance, accompanied by songs by acclaimed composer and published home cook Orlando Gough. Audiences are invited to join in by bringing and sharing homemade dishes and locally sourced or homegrown food for table picnics. It’s a Whitechapel Village Hall, Goosnargh from 7,30pm. Book at 01995 640504. Join artist David Hulston to explore mark-making and colour-mixing using paint – but with no paintbrushes. This workshop is an opportunity for children to create with paint - wear appropriate clothing. Most suitable for children aged up to five years old. It’s in The Playroom, in the Peter Scott Gallery at Lancaster University. There are two sessions, one from 10am until 10.45am and then one from 11.15am until 12pm. Admission is £2.50 adults; £3.50 children). Celebrating everything spring, this is the Daffodil Dash is a family fun walk/treasure hunt around Towneley Park. Organised by Carers Link Lancashire, all proceeds will go to support unpaid carers in East Lancashire. There’s also a chance to meet their very own daffodil character. A perfect day out for all the family. Suitable footwear is recommended. Admission is £3 per child (includes a small gift). Runs from 11am until 1pm. For more information call Carers Link Lancashire on 01254 387444. This is an environmental/wildlife group for children aged eight to 14 years, who meet on the second Saturday of the month (except August). They will take part in nature walks, wildlife surveys, practical work, but also have lots of fun. The theme for this month is Spring in Your Step. It runs from 10am until 12.30pm at Wyre Estuary Country Park in Thornton. Admission is £1. Booking is essential and parental consent forms are required. For further details telephone 07989 579351. A fun filled, interactive afternoon of musical activities and an exciting concert that will take you on an adventure across the sea - and it’s all happening at Preston’s Guild Hall. Discover different instrument workshops, explore the ‘petting zoo’ getting up close to different instruments and listen to the full orchestra play some exhilarating music. Workshops from 11.30am; concert at 2pm. Ticket prices vary. 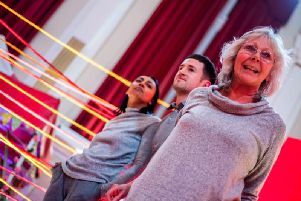 For more information visit https://prestonguildhall.co.uk/shows/family-music-day-adventures-at-sea/ or call 01772 804444. Explore Brockholes Nature Reserve to find out more about their wildlife mums that are busy looking after their families there. There is a Mother’s Day treat for those completely the trail. Admission is just £3 per trail pack and includes a Brockholes pencil and a chocolate treat on completion. There is no booking needed for this event, simply drop by and purchase your map pack. Normal parking charges also apply at the reserve, which is open from 10am until 3pm. Suitable footwear and clothing essential. Galloway’s Society for the Blind are gearing up for their 150th birthday party which is taking place at Howick House, Liverpool Road in Penwortham between 11am and 4pm. The day promises to be a fun-filled day and will host a range of activities for the whole family to enjoy, including bouncy castles, a barbecue, a variety of stalls, games, face-painting and much, much more. For more information on the birthday party or the society, call them on 01772 744148. Preston Cecilian Choral Society are in action tomorrow night when they will be performing Dvorak’s Stabat Mater. The concert will feature several soloists - Aimee Presswood (soprano), Amy Shaw (mezzo-soprano), Alex Grainger (tenor - pictured) and Arthur Bruce (baritone). It’s at Preston’s Minster church at 7.30pm. Tickets £12, concessions £10. Join Ginette and Debra to make some poppies for the WW1 Centenary art installation planned at Blackpool Victoria Hospital in November 2018. For this installation 30,000 poppies are needed to remember those who were killed and injured in the First World War. These can be knitted or crocheted, whatever your preference. All wool and lunch will be provided by Unison. Go along for a natter and make new friends too. Meet at the far end of the Restaurant, behind the coffee counter on Monday, between 11.30am and 3pm. Email jane.eyre@bfwhospitals.nhs.uk for more information. On Tuesday why not head to Great Eccleston for a pleasant walk through the village and along the River Wyre. This is one of the more advanced walks, including stiles. These regular walks are designed to help you get fit, stay fit and keep healthy. Walking shoes will be required for this walk. Meet at Great Eccleston Village Centre for a prompt 2pm start. The walk is expected to take about one hour and is free to join. For more details call 01995 602125. The Ribble Valley Music Festival is a major event with a reputation for high standards. It takes place from spring to autumn with concerts of various music styles at venues including Whalley Abbey and churches in beautiful locations around the Ribble Valley. It starts tomorrow with the Milnrow Band at Clitheroe. For more details call 01254 384893.